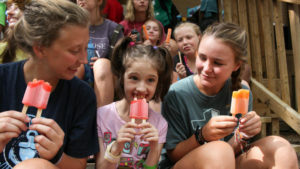 Camp Barnabas is a unique ministry providing Christian camping experiences to people with special needs and chronic illnesses, along with their siblings. 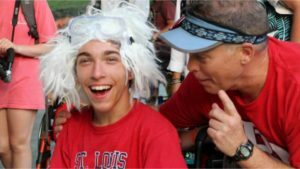 The program exists to offer life-changing experiences to campers and to the people who serve them. Our wonderful campers with special needs get to experience camp just as any typical camper would through the adaptation of activities. We will spend a week of selflessness to serve those who are often on the fringe of society. You can get an application in the youth rooms, at the welcome counter or click here to download the application. Barnstormers work hard to help make camp happen. Duties include waiting tables at meal times, washing dishes, helping keep the kitchen clean, and cleaning toilets and bathrooms around camp. We have college staff that help lead them in these tasks as well as lead Bible studies and fun activities. Each Barnstormer is assigned to a cabin, where they will get to build relationships with campers and participate in daily activities with them. The best Barnstormers are MATURE, 14-or 15-year-olds with a very strong work ethic. These incredible individuals are placed with a camper to unconditionally love and accept their camper, care for all of their camper’s needs and assist their camper in having the most awesome week of summer camp ever. To be an effective counselor, you must be willing to put aside your own personal desires and needs during your entire week of service. You must be willing to share God’s word in any circumstance. The counselors live in the cabins with their campers and are responsible for assisting their campers in any way they need in order for the camper to have a successful and awesome week of camp. 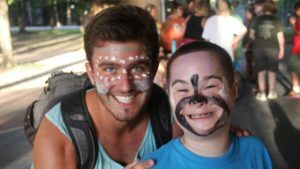 Some counselors work with children with special needs, while others work with sibling campers. The campers and counselors experience all of the activities at camp together. This means that counselors must be willing and able to participate fully in all activities. This is a huge responsibility, a 23-hour commitment daily. We make every effort to allow for one hour of personal time off every day. THE COUNSELOR MUST BE MATURE AND WILLING TO WORK WITH SIBLINGS OR CAMPERS WITH SPECIAL NEEDS. You will not know your assignment until you arrive, but please come willing to minister wherever God needs you! Each week, we need special adults who are assigned to work with a particular cabin for the week. This role requires you to be dedicated 100% to serving in whatever capacity you may be needed. Your job may consist of providing relief to the cabin counselors or summer staff, doing laundry, or assisting with camper needs such as bathing, changing, dressing, or feeding. You will also be serving one meal a day in the kitchen.